At least nine people have lost their lives in Austria, Germany and the Czech Republic as Hurricane Emma struck central Europe.One of Germany’s high speed trains was taken out of action and several rail lines were closed as winds reached 190 kilometres an hour. Three people died in Germany.In some areas, heavy rainfall caused flooding as well.In Austria the death toll reached four, including two German tourists, with at least two of the people killed by trees blown down by high winds. Some 10,000 households in the north of the country have been left without electricity. Skiers in the Alps were warned to take extra care after a metre of snow fell and a Bundesliga football match was cancelled. 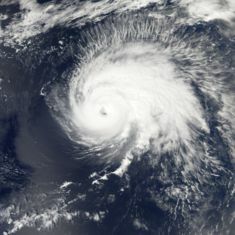 Across the countries hit by Emma, the damage is estimated to be worth tens of millions of euros. Weather experts say winds are likely to pick up again on Sunday morning. In the Czech Republic, two people died – an 11-year-old girl who was crushed by a falling tree and a man, 80, who was hit by a piece of metal. Around 100,000 people are without electricity and transport has been disrupted throughout the country. While hurricanes are common in coastal regions, it does seem quite unusual when they cause deaths in countries that do not even border the ocean. As I indicated earlier this morning, these types of things may be parts of what Jesus referred to as “the beginning of sorrows” (Matthew 24:8) before the great tribulation (Matthew 24:21). But the great tribulation itself will not begin until at least 2012 (some details are in the article End of Mayan Calendar 2012–Might 2012 Mean Something?). This entry was posted on Saturday, March 1st, 2008 at 1:25 pm	and is filed under Prophecy. Floods in Europe: Danube past record levels.